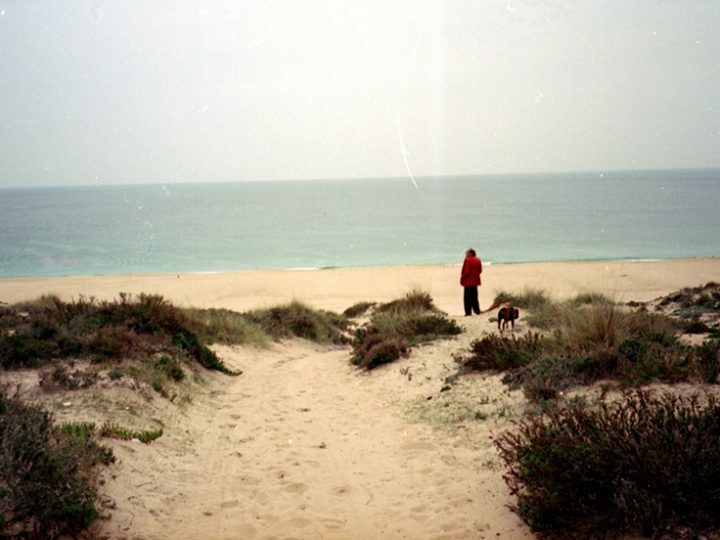 João Louro’s work is eminently conceptual. 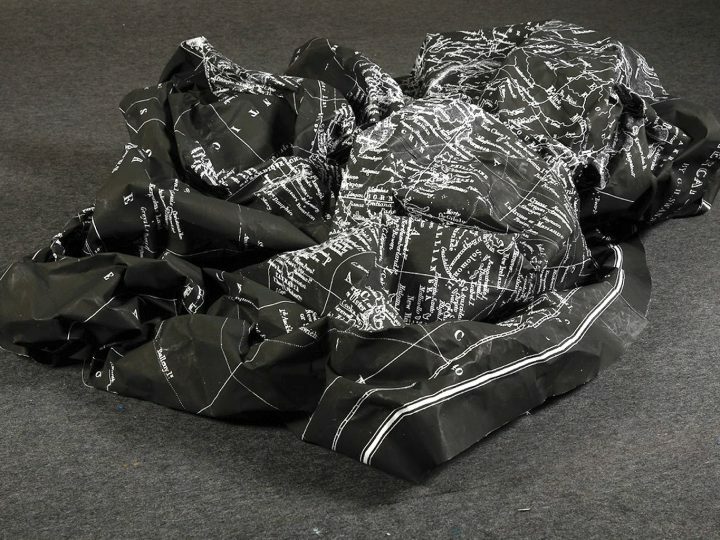 His work is assumed as a strategic device for critical mediation of reality, exploring with some insistence the excess and the power of image and the written word in western societies. Considered a critic “of the symbolic economy that defines modernity”, João Louro often resorts to objects, signs, images and real situations, giving them new meanings, even if the references he employs keep the same appearance. The use of pre-existing elements, often combined unexpectedly in order to create new realities, constitutes a structuring device of his work. So, his body of work, including the “blind images”, inherently question the visual experience, a multiplicity of meanings and senses that go far beyond the physical work for which the spectator is attracted. The exhibition conceived by João Louro for Bragança, comprised mostly of unpublished works, is based in the strong connection between the architectural space, the museum, viewed as a catalyst for a kind of work that appeals to the architecture of that same space as another form of architecture, which is the intimate space of a house: the Malaparte’s House. It is, therefore, regarding that house that Louro reinvents this experience that crisscrosses cinema, literature and art itself. 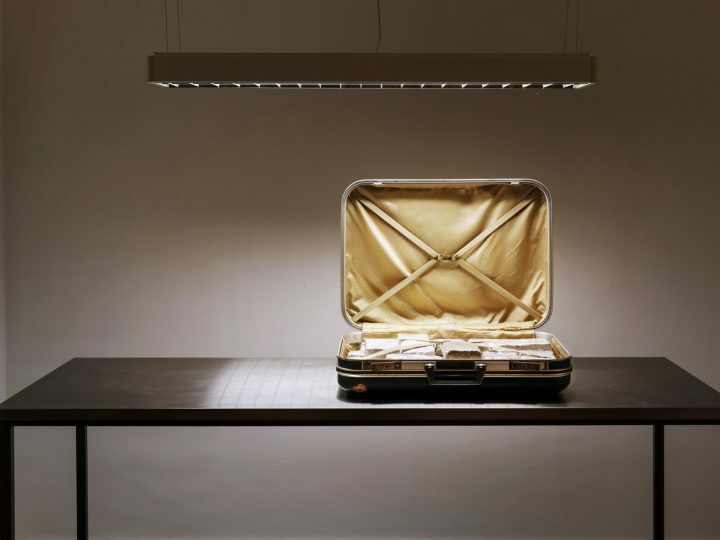 Jorge da Costa – As in Play, Rec and Pause, presented at Christopher Grimes Gallery in Santa Monica, U.S.A. there’s a notorious return to the “non-images”, only now deprived of the textual reference that earlier in your work permitted the viewer to, somehow, imagine or perceive the absent image or situation. Why? JC – As suggested in the reference to the famous magician and escaper that entitles the exhibition? JL – Exactly. It’s, somehow, the art of evasion. It’s minimal art! I don’t need major means: I just need that “frame” and an evocation. The spectator does everything else! 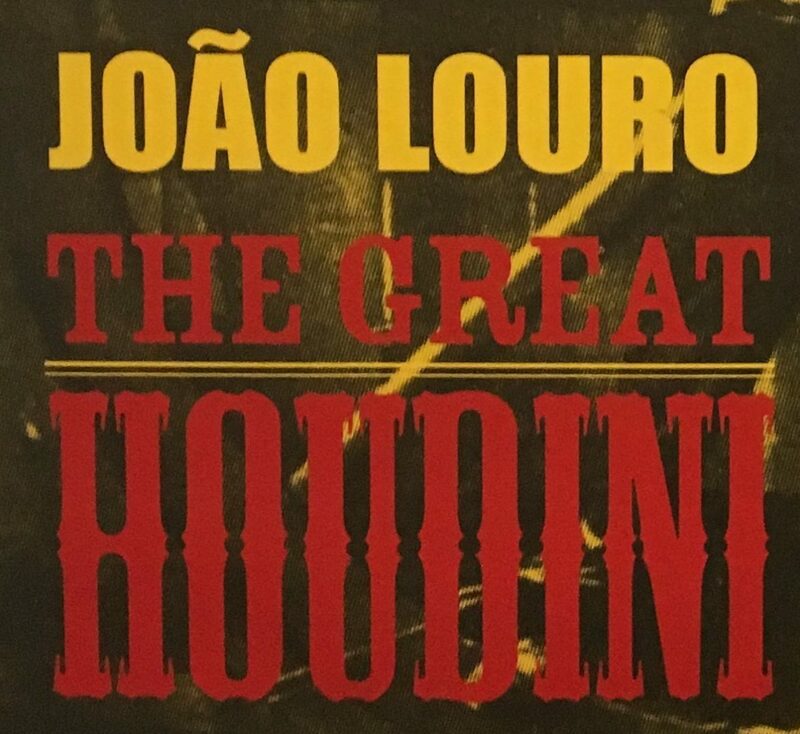 However the image never left its place, as in Houdini and his tricks. The image was always there, in the mind of those who see the work. JC – But the absence of images necessarily gives the viewer the task of carrying on a reconstitution process, conferring them an active role. JL – I was always interested in the active viewer. And more than an active one, a participative one. That’s the only way to break through the actual paradigm, this means, from where we still communicate, the romantic paradigm of artist/spectator. That paradigm can be interrupted if the spectator concludes the artwork. That’s why I give so much importance to the viewer. Only he has the key to dismantle that paradigm. JC – But, doesn’t that mean that each artwork will eventually be perceived or mentally reconstituted regarding the viewer’s imagery limitations and seen in very different senses or even so in very unadjusted meanings? JL – In my opinion that’s an asset. That viewer’s imagery is what mostly interests me. My meanings are secondary and working with the viewer I flee from style, from the artist hand mark and from pretentiousness, which are the hallmark of many artists. I just concede a space, a fragment, a text, which will produce an effect I don’t control, nor do I want to control. JC – However works like “Site Scenes” lead us to very specific places, which have their spatial reference presented as an architecture plant, or appealing to very specific situations abducted from the cinematic world, which are a constant in your work. JL – Well … My work is vast. I often appeal to several approaches. In this specific case of “Site Scenes” more than the fragment, I also call on the architecture. These are works in which the frame is within the frame and create that other atmosphere approach that I wanted to creat in this exhibition, which is to place architecture within architecture. 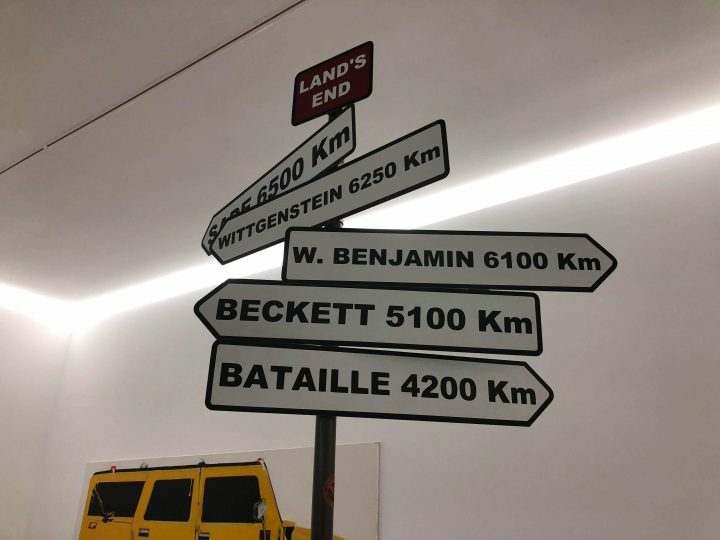 JC – This museum projected by architect Eduardo Souto Moura would then be assumed as a leitmotiv for creating a set of new artworks, capable of interfering or “talking” with the architecture of the exhibition space. JL – This space immediately interested me as soon as I started feeling it. I was willing to interact with it in an active way. This is a space that not only enables the display of artworks in an orderly or a common way, but it also participates in the artwork itself, transforming it. It is almost like if it was a skin. As a home … And by home I mean the architectural space but also the life within, with their own objects, people and situations. This is the kind of architecture that mostly interests me. A place that is alive and living. JC – So you bring into the interior of the museum a very specific architectural reference, which is the famous house of Curzio Malaparte in Capri. JL – Yes! As I told you before… There are works that are attractive to be seen in a place like this one and realize how they could interact … The “Malaparte House” is the gateway to the architecture of the museum. When you enter the space of the museum, it immediately becomes the interior of a house, through that precise work. As you can see, the name writing in that door, “Curzio Malaparte” is inverted. This means we are already inside the space and not at the front door. In that precise moment the space embraces us. JC – However, more than as in an architectonic space aren’t you rather suggesting people to enter as voyeurs in a private place which is the lonely refuge of the controversial Italian writer and simultaneously into his literary production (or even into his only film production “The Forbidden Christ”) as you did before with other movies such as “L. A. Confidential” or “Le Mépris? JL – It is an invitation for the viewer to lose himself among areas such as architecture, literature and cinema through my work. JC – In contrast with the monochrome of your “Blind Images” there are works like “Lucy in the Sky with Diamonds”, where you inscribed the chemical formula of the LSD, overloading the surface with information, making the approach from a wide variety of materials and techniques. JC – …resorting to the word. This appeal to thee written word as raw material is also very present in “L’Avenir Dure Longtemps”. JL – That work comes from the title of a book by Louis Althusser. In it, the philosopher defends himself for posterity of the crime he committed against his wife. It is written in the same line of a will once he was considered not imputable for the crime he committed and sent to a mental institution; he couldn’t stand before court to explain the motives which led him to perpetrate such barbarian act. This book deeply touched me and then I started to think ways to observe inside the words. This became increassingly appealing and interesting to me, until I understood that words have nuclear power. Perhaps some day when it becomes be possible to fission a word, we can find the same energy that exists inside an atom. As I followed this kind of thought, I developed these works that, far from reaching the core of the word, they nonetheless imply the dissection of sentences. It is from these dissected sentences that new meanings and new words come along. There is a whole new alphabet blossoming from the ancient words. There’s also the appearance of authors, we acknowledge the word “Durel”… can it refer to Lawrence Durrell? It is still an unsavory and puzzling map, but yet a powerful weapon. JC – However, resorting to words such as “Inferno” combined with the names of some major fashion capitals emphasizes the heavily critical approach your work holds. JL – I like the use of the popular symbol. I don’t look for something which has encrypted or esoteric connotations. That’s the main reason I recurrently use the western vocabulary and its symbolic language under the form of logos and trademarks. These symbols smooth the progress of my work. They are compressed information and I don’t need to describe any particular situation. The appearance of one of these symbols produces a complex situation. I have no particular interest as an artist in describing a landscape. I use a symbol that immediately leads to it. I just open a door, then the viewer can add their favorite trees, the animals he/she prefers and the river of his/her youth. That’s why, in my work, I only need to induce, never to describe. JC – This critical side of your work, owed to its continuous dialogue with the social contemporaneity, is brought to the limit when this approach includes the questioning of the American Way of Life. JL – America for me is a challenging universe. Without a sign…I mean, I have a love-hate relationship with America. It is this complexity that makes me visualize the face of human existence. It’s a huge laboratory of social experiences. America is a bench of nature sciences, with all the reagents at hand, without bureaucracy. Even when the drawers are closed, with some controversial issues, we can feel their smell. That’s what matters to me. JC – Beyond the critical intention, is there, in any way, any pedagogical intention, this means, a wish to call people’s attention to the problems of globalization? JL – I don’t see myself as a pedagogue. My purpose is to speak to the largest number of people. Nevertheless, I set up a fundamental and crucial rule – never to step down to the level of entertainment or to step up to the level of encryptation. This is my field of action, not always successfully, but this is the rule I bear in mind. Therefore, I attempt neither to be popular nor mediunic. I must also state that art is not politics. It doesn’t compete with politics, which demands a time-compressed action. Art stretches through time and, if it isn’t mere political propaganda, it will always replace politics. Art makes us understand the world and the art that most interests me allows me to understand the contemporary world. JC – Is it also having that in mind that you get hold of concrete objects, such as the highways panels, changing their initial role and subverting information? JL – I use concrete objects, such as highway signs because the viewer swiftly assimilates them. I don’t need to mediate. They are direct, perceptible and automatically incorporated. Everyone recognises them. Only then the second level of action begins, which are their contents. The viewer notices the “error” after having incorporated the form. This means that the form is the path that leads the viewer to the content, the second level of reading. JL – The form is only a trap to attract viewer’s attention. Everything else is played after the work hostages his attention. And it’s in this field of action I want to play. It is when the artwork achieves its major relevance.